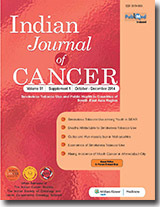 Oropharynx is an important site of cancer in India. Global comparison indicates higher incidences in India. Radiotherapy remains an important treatment modality. Efforts to improve loco-regional treatment and prolong survival are areas of focus. Radiosensitizers in hypoxic tumors have shown promise. 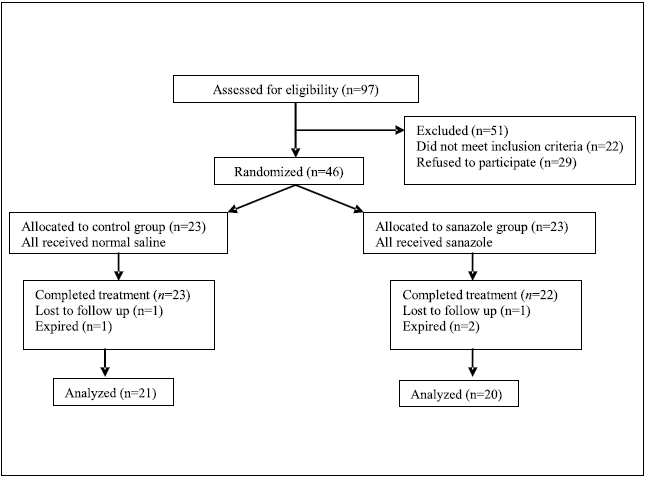 Aim: To study the safety and radiosensitizing efficacy of sanazole in oropharyngeal squamous cell carcinoma (stage T2-4, N0-3, M0) as phase-II double blind controlled trial in patients treated with conventional radiotherapy. SETTINGS AND DESIGN: Single institutional, randomized, double-blind, placebo-controlled trial. MATERIALS AND METHODS: Group 1 (control; n =23) received normal saline infusion, group 2 (test; n =23) received sanazole biweekly 1.25 g intravenous infusion 15 minutes before radiotherapy. Surrogate end points of efficacy were tumor and nodal size; safety parameters were mucositis, salivary and skin reactions, dysphagia, vomiting, dysgeusia and neurological deficit. Investigators blinded to the trial evaluated patients, weekly during treatment for six weeks and thereafter monthly for three months. STATISTICAL METHODS: Non-parametric, Friedman's, Chi square, Mann-Whitney U tests. RESULTS: In the test, 15 (65%) patients had complete response, five (22%) partial/no response, two (9%) died, one (4%) lost to follow up. In the control, five (22%) patients had complete response, 16 (70%) partial/no response, one (4%) died, one (4%) lost to follow up. Short-term loco-regional response was better in the test ( DF = 3 , 95% Confidence Interval 0.418, 0.452, P=0.0048 ). In the test group significant vomiting and one case of grade 3 neurological deficit was observed. CONCLUSION: The study validates the usefulness of sanazole for initial loco-regional control in oropharyngeal cancers. Background: Clinical data relating to human papillomavirus (HPV) infection and p53 status in cervical cancer has been sparse and confusing. Aim: To evaluate high-risk HPV and expression of tumor suppressor protein p53 in squamous cell carcinoma of cervix and to assess response to mitomycin-C in neo-adjuvant chemotherapy. Setting and Design: Teaching College Hospital; Gynecologic Oncology Unit and Department of Pathology. Prospective, randomized. Materials and Methods: Expression of p53 protein was assessed, using immunohistochemistry with mouse monoclonal antibody in 30 consecutive patients undergoing radical hysterectomy or admitted for neo-adjuvant chemotherapy. Human papillomavirus DNA (HPV DNA) was assessed using hybrid capture II technology. Patients eligible for chemotherapy were randomized into vincristine, bleomycin and cisplatin (VBP) group and VBP with mitomycin C group. Statistical Analysis: Chi-square test, one-way ANOVA, Pearson's correlation; Mann-Whitney, McNemar and Fischer's exact tests were used for statistical analysis. 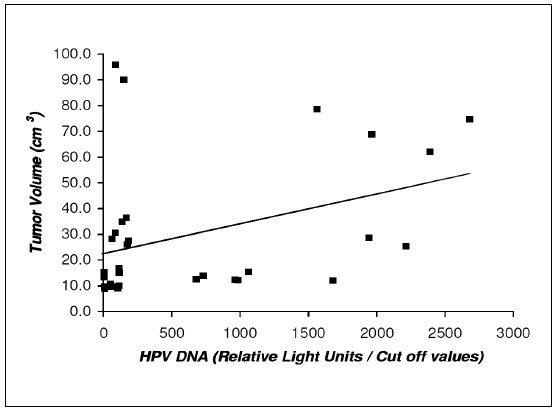 Results: All patients with cancer cervix were positive for high-risk HPV DNA having relative light units/cut off values ranging from 3.4-2389.21 ( P value = 0.006). High viral load of high risk HPV DNA was seen in advanced stages ( P = 0.05) and an association of viral load with tumor volume was also seen (r=0.361, P =0.05). Analysis of p53 protein in cervical carcinoma patient showed expression in 50% of cancer specimens ( P value < 0.001). McNemar's and Fischer's exact test showed no change in p53 status post-chemotherapy; however 66% of stage II B patients in VBP-M group became operable. Conclusion: High-risk HPV was universally present in all cases of cancer cervix and viral load was associated with stage and tumor volume while p53 protein was expressed in 50% of cases suggesting deregulation. More studies using mitomycin-C in cervical cancer treatment protocols are needed. Background: A number of studies have shown over-expression of cox-2 in breast cancer. Also it has been recorded that human breast cancer expresses high level of cox-2 and 12-lipoxygenase which may be beneficial in future therapy plan for those patients. Aims:The present study aims to examine the level of transcripts of cox-2 and 12-lipoxygenase in Egyptian breast cancer patients and to compare between the expressions of both enzymes and TNM staging, hormone receptors status (including estrogen and progesterone) and HER2/neu expression. Materials and Methods:Total cellular RNA was extracted from 64 frozen tissue samples of breast carcinoma and their corresponding normal adjacent tissues. 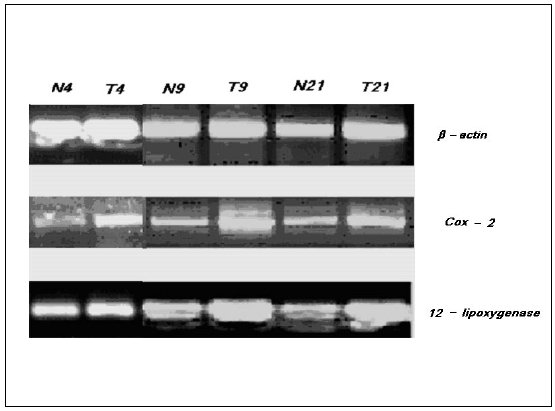 Cox-2 and 12-lipooxygenase expressions were detected using RT-PCR. Hormonal receptors as well as HER2/neu were detected immuno-histochemically for each patient. Results: About 47 and 62.5% of carcinoma samples showed over-expression of cox-2 and 12-lipooxygenase respectively as compared to their corresponding normal tissues. The results revealed that cox-2 significantly associated with TNM staging ( P =0.0047) and hormonal receptors status ( P = 0.0201). The relationship between cox-2 and HER2/neu expression was close to a significant value ( P =0.0747). 12-lipooxygenase showed only significant association with TNM staging ( P =0.0076). Neither hormonal receptors nor HER2/neu showed significant association with this enzyme. Conclusion: Elevated levels of cox-2 and 12-lipoxygenase expression were detected in human breast cancer. Also, the results revealed that cox-2 and 12-lipooxygenase mRNA expressions are associated with TNM staging in human breast cancer. Furthermore, there is an inverse association between cox-2 expression and hormonal receptor status. This observation may drive us to the possible role of those two enzymes in determining the plan of therapy of breast cancer patients. BACKGROUND: Meta-analysis is a statistical tool for combining and integrating the results of independent studies of a given scientific issue. The present investigation was initiated to investigate case-referent studies of lung cancer risk from specific environmental and occupational pollutants, using detailed individual exposure data. MATERIALS AND METHODS: To examine the risk of lung cancer associated with environmental and occupational pollutants, a meta-analysis of published case-control studies was undertaken using a random effects model. For this study, the papers were selected for review from electronic search of PubMed, Medline and Google Scholar during 1990-2006. The principal outcome measure was the odds ratio for the risk of lung cancer. Twelve study reports detailing the relationship between the lung cancer and the type of exposure were identified. RESULTS: The odds ratio of asbestos, cooking fuel, cooking fumes, motor and diesel exhaust related to lung cancer were 1.67, 1.99, 2.52 and 1.42 ( P <0.001), respectively. 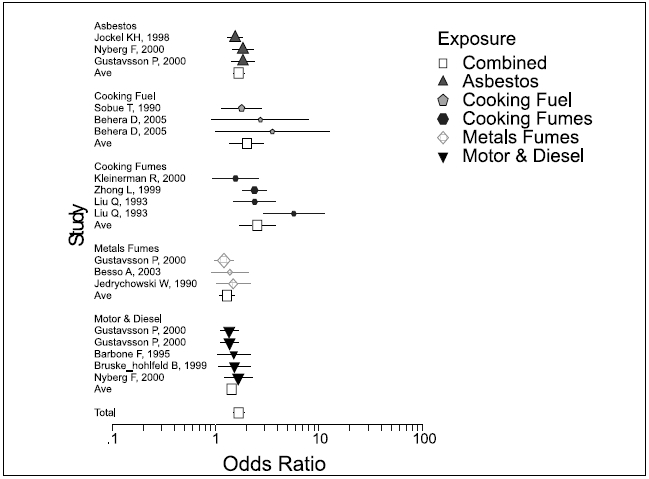 The odds ratio of metal fumes related to lung cancer was 1.28 (0.001< P <0.01). The combined odds ratio for the environmental and occupational exposure related to lung cancer was 1.67 ( P <0.001). CONCLUSIONS: The meta-analysis of the present study shows the magnitude association between asbestos, cooking fumes, cooking fuels, motor and diesel exhaust, with lung cancer risk. Lung cancer risk may be reduced by controlling exposure levels. Background: The role of adjuvant therapy in gastric cancer has been controversial. Aim : In this study, we report our experience with adjuvant chemotherapy and radiotherapy in patients with non-metastatic gastric cancer. Settings and Design : Fifty patients were reviewed and assigned to three therapeutic groups. 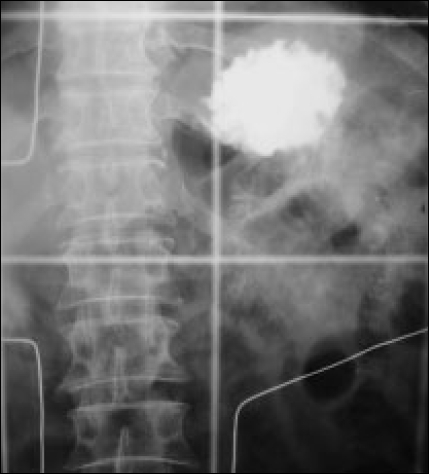 Materials and methods: Twenty patients received radiotherapy with concomitant administration of 5-fluorouracil and leucovorin on the first and last three days of radiotherapy; 20 patients received a five-day cycle 5-fluorouracil and leucovorin followed four to five weeks later by radiotherapy concomitant with the administration of fluorouracil on the first and the last three days of radiotherapy. Four weeks after radiotherapy two more five-day cycles of chemotherapy were administered; 10 patients received three cycles of cisplatin/docetaxel followed by radiotherapy and three additional cycles of chemotherapy after the completion of radiotherapy. Statistical Analysis : Patients were evaluated for treatment-related toxicity, local recurrences, distant metastases and deaths. We also aimed to make any possible comparisons between different chemo-radiation protocols. Results0 : Within a median follow-up of 21,5 months seven patients developed local recurrence and 17 patients developed distant metastases. The overall death proportion was 42% (95% CI 28.2-56.8%). Despite the limited number of patients, no statistically significant differences in local recurrences, distant metastases and deaths were observed between the three protocols. Acute and long-term treatment-related toxicity was low and no treatment-related deaths were observed. Conclusion: Despite variations of chemotherapy, our study demonstrated that combined chemo-radiotherapy for patients with resected gastric cancer can be administered safely, with acceptable toxicity.